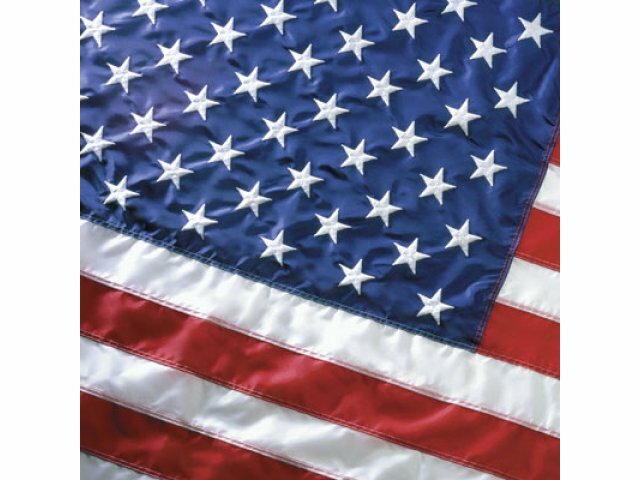 This Nylon American Flag will display the stars and stripes with pride for many years to come. It is constructed for maximum durability and aesthetic appeal. All components are securely connected for your long-term enjoyment. With sewn stripes and embroidered stars, you don't have to worry about the pattern rubbing off. Trying to decide how and where to hang up your flag? 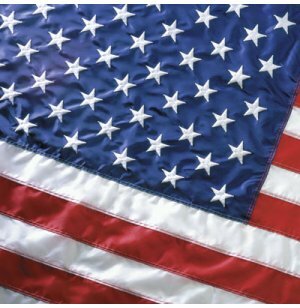 Brass grommets make it easy to pin your flag onto a school bulletin board, hang it across the building entrance, attach it to the flagpole or utilize a number of other display possibilities. When it comes to encouraging your students or employees to support their country, nothing beats a well-placed genuine nylon American flag. Dependable Design: Sewn stripes and embroidered rayon stars will maintain their luster for many years. Easy Hanging: Brass grommets facilitate a number of display possibilities.